I’ll admit it. When I saw the tagline for Breckenridge Distillery—“the world’s highest distillery”—I first thought of Colorado’s legalization of marijuana. Only seconds later did I realize the slogan was instead a nod to Breckenridge’s elevation of 9,600 feet above sea level. Such a clever play on words. Today, Nolt says, it would be fair to call his distillery successful. In part, this is due to the “unique features of the Breckenridge water we use for proofing and blending every bottle of our spirits.” The Breckenridge product catalog includes a gin, several vodkas, a spiced rum, a bitter, a whiskey distilled from malt mash, and a blend of straight bourbon whiskeys simply called Breckenridge Bourbon. That mash bill is 56% corn, 38% rye, and 6% malted barley. It is fermented in an open-top fermenter and twice-distilled in a copper-pot still. It is then set to barrel-age at 120-proof (no one knows for sure how long, but most seem to think only for two or three years; if true, the bourbon should have an age statement, which it does not). After aging, it is diluted with melted snow from the Rocky Mountains. In the glass, Breckenridge Bourbon sports a dark copper color with a nose of brown sugar, candied pecan, green raisin, and banana. The flavor is nicely balanced and complex with a bready texture and abundant warm spice. The taste includes vanilla, buttered corn, honey, caramel, oak, and cinnamon. The finish is incredibly long-lasting with a pronounced spice and a numbing heat. That numbing heat, to me, is the signature characteristic of this spirit, and a highly enjoyable sensation. It is significantly reduced if you add more than a drop of water, or if you serve the bourbon on the rocks. Therefore, I suggest you first try Breckenridge Bourbon neat (or, at the very most, add just a drop of room-temperature water). Is this a young bourbon? Yes. Does it carry an age statement? No. That said, I think $40 is a very fair price since it delivers such a unique, satisfying, harmonious experience. I highly doubt you will be disappointed if you pick up a bottle. When you do, pair it with a medium-bodied smoke that brings its own complexity to the table. For starters, I would suggest the Gaaja Maduro Torpedo or the El Güegüense Churchill. If what you say is true, Breckenridge releases a 3-year old bourbon with no age statement. This is in clear violation of the TTB regs which require a bourbon to state the age of the youngest whiskey in the blend, if under 4-years old. Irrespective of the quality of the hooch, this is something a whiskey blogger should make clear, and challenge, IMO. Again, if this is really the case, Breckenridge should be ashamed of itself. Now it occurs to me, you are a cigar blogger, and not a whiskey blogger, so my apologies. Still, if this is true, it’s a major violation, IMO. For my penance I’ll go smoke a nice Padron. Now that I’ve dug into his a bit further, I am going to update the article to reflect the fact that it is unclear exactly how long the bourbon is aged, though there is general agreement this is a very young bourbon. I still stand by my assessment of the bourbon, but would agree with Mr. Cowdery that it’s frustrating Breckenridge isn’t more forthcoming and transparent. IMO, you can’t do better than Chuck Cowdery, as a source for just about anything American Whiskey related. And, yes, that edit probably makes things a bit clearly. But my original comment was based on my own misreading of your post. I even double checked to see if you discussed the 4-year age regs. Apparently, I just completely missed it. My bad. My only explanation is, I posted a tad too sober. Carry on. 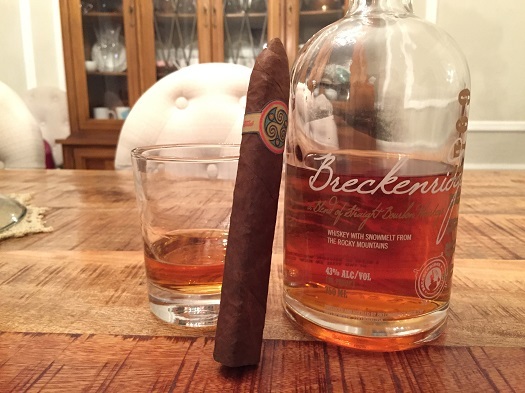 Love the blog and check in quite often for cigar reviews.